During my recent series of posts on Levi’s bespoke jeans, a reader commented that he didn’t like denim because it didn’t drape like wool, linen or other materials commonly used for suiting. He’s not wrong, but denim and other cotton materials have a beauty all of their own. That beauty is more similar to leather than to wool. 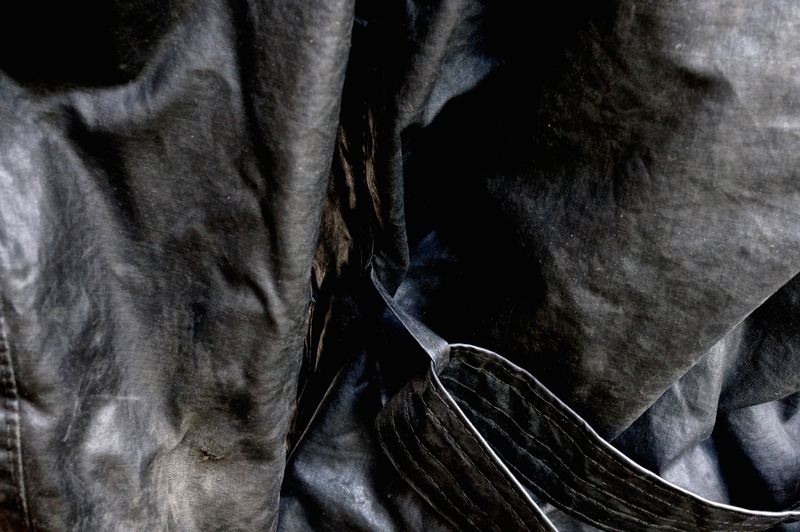 Like leather, these cottons adapt to the shape of the wearer. They take on his physique, become unique and personalised, and are more precious as a result. A structured suit jacket, of course, does this too. But leather reflects the wearer on the surface as well as inside – in the patina that builds up through use, shape and circumstance. This is the first of a handful of posts demonstrating that beauty. Although part of the ‘How great things age’ series, they focus on vintage items and those not normally associated with tailoring, such as denim, leather and waxed cotton. The first piece is my 1960s Barbour motorcycling jacket. Originally part of a suit, it still has the internal buttons that would have attached the matching waxed-cotton trousers. It has clearly seen a lot of user over the years, with darning in several places. The great thing about cotton, of course, is that even the outside can easily be darned when it frays or rips. 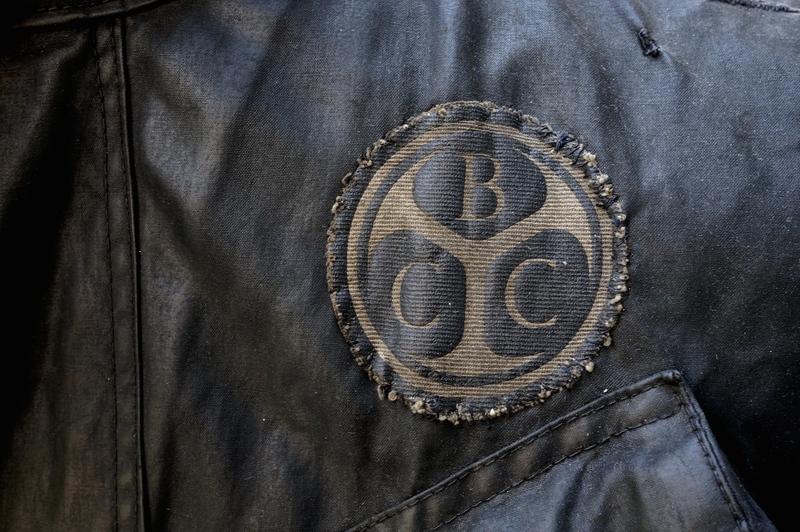 Note the original cycling club patch, with has also been carefully sewn on by hand. This Barbour is from the excellent Vintage Showroom in Covent Garden, which I recommend (also Josh Sims’s book on the same store). 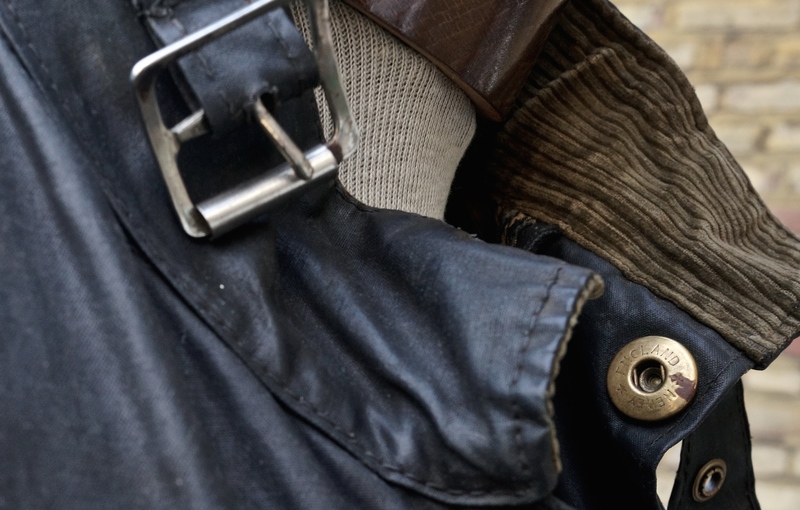 However, as with most vintage jackets be aware that they will be cut shorter and squarer than any modern piece, and it may therefore take quite a while to find one that fits well. The only advantage of models like the Trialmaster is the belt, which can be cinched to deal with some of the squareness. For more on vintage pieces, see my post on RRL. And my recent feature for The Telegraph contained more about the history of the motorcycle jacket and other pieces. You can follow the discussion on How great things age: Barbour motorcycle jacket by entering your email address in the box below. You will then receive an email every time a new comment is added. These will also contain a link to a page where you can stop the alerts, and remove all of your related data from the site. Simon, I am having a bespoke dark navy linen blazer made. I am currently pondering detail and would ask for your help. On a jacket that will be used in both casual and semi-formal situations I am weighing up exterior pocket styles and need some advice (my tailor has been vague on the subject). I would like to try ‘U’ shaped patch style pockets, but I am concerned that the linen fabric will ‘droop’ or sag over time if used in this way. However, I am worried that using normal slit pockets with flaps will look a little boring! Any advice gratefully received. I love the look of waxed jackets but just cant wear them. Find them heavy on the back & sweat profusely in them as they don’t breath at all. I don’t understand how other people find them comfortable to wear .. especially casually in the city (I’ve even seen them worn over suits on clothing blogs .. some of the younger armour guys especially like to wear barbour waxed coats over fine tailored clothing .. perhaps proof they are far stronger men than me). Thanks. That’s always going to be a problem with most waterproofed materials – certainly the less modern ones. Great article and glad to see, alongside the RRL article adjoined, you are moving into the dark side of ready to wear Simon. 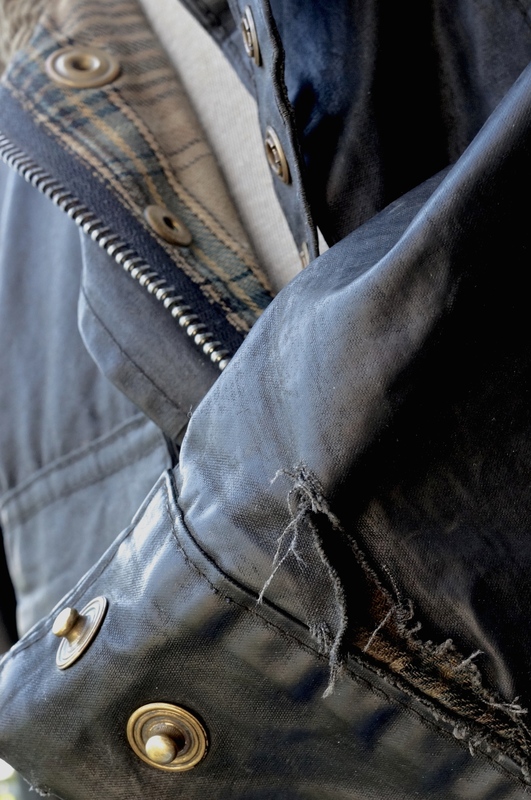 You’ve raised an important First World Problem in this piece – what do you do when you have too many nice jackets to wear to really break them in? 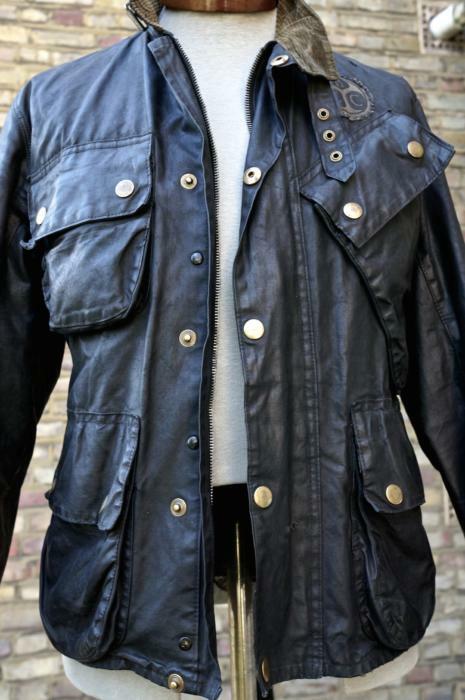 (Leather / wax cotton, Barbour, BELSTAFF etc). I am not a fan of artificially distressing stuff , but nor am I really a second hand guy. Do you think I should hire someone of my same build and frame to do some manual labour outdoors in my jackets? I wonder if the vintage Barbours were squarer to accommodate bulkier, presumably woolen, clothing underneath? Brits were hardly beefier in the olden days. Regarding wearing in cloths, Jilly Cooper wrote a very funny book years ago about class. There is a very interesting chapter on clothing. She recounts how the (last) duke of Westminster used to have his valet wear in his clothing for the first year or two so they didn’t look too new. Now, if I can only find a valet with a 38 inch waist and 43 chest! Yes I remember that. And a few members of the royal families (eg Middle East) still do that. The time I can’t understand it is with shoes. The Arabs and Russians order 20-30 pairs, which require wearing-in by their own feet, not someone else’s (the footprint and bend points will be in the wrong place). So they spend all that money and they will never get the pleasure of shoes that actually mould to their feet. Rather silly. Simon, I’ve been eyeing a waxed cotton jacket for the fall. My first instinct was to go with an olive cotton, but I’m having second thoughts after seeing this fetching navy. Any insight into which color will be more versatile? Which do you prefer? Thanks! Ah, thank you! I see now that your vintage Barbour is black? I’ve been looking at a company called Claymore Jackets up in East Yorkshire. Have you heard of them? Any thoughts on their operation? I gather it’s a contingent of craftspeople who worked for Belstaff before Belstaff outsourced production. They deal in MTM, which is a boon for my 28cm drop. If it wasn’t for my odd shape, I would certainly consider the Drakes version, as it looks quite fetching.